Fehlmann’s every new release is significant. After world-changing days in The Orb, and before that in Palais Schaumburg, one can expect the gentleman would spend quiet days in the Caribbean, after a man’s work in the world or music. 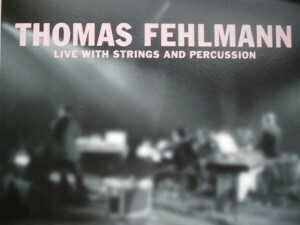 But Fehlmann is still around and returns to Kompakt with a live recording. Yes, it’s live and you can hear crowd noise in the background. Two-track single is dedicated to beautiful electronic music with strong acoustic elements. Strings, horns and subtle percussion follow to the beatless ambient intro in “Titan One”. Violins and repetitive patterns add some intensity to the second half of the composition that reminds of modern classical works. It is not a far-fetched statement because “Titan One” is inspired by the 1st Symphony of Gustav Mahler, the sleeve notes say. Strings and percussion are also well present in more mechanical but bright “DFM” that runs with a bundle of chords. It contains well concealed trippy elements of The Orb, or is it just my imagination. Well-constructed mature music that could address the audiences who prefer concerts starting well before midnight. I hope Mr Fehlmann does not think about retirement yet.